The Artsakh branch of Mashtots Matenadaran - the Matenadaran-Gandzasar scientific and cultural center has two main departments: the Scientific Research Department and the Museum Complex, in which are exhibited more than 100 manuscripts created in Artsakh and Syunik (historical Armenia), texts of rare documents and copies, old printed books on history Artsakh, as well as manuscripts "redeemed from captivity" or brought to Artsakh and stored in local churches and monasteries. For the first time, the Artsakh manuscripts disseminated around the world were gathered under one roof which created new opportunities for fruitful research in different scientific areas. The building adjacent to the monastery complex was reconstructed with the funds provided by “Pyunik” All-Armenian Fund for the Development of Human Resources. The branch operates in the structure of Matenadaran after Mesrop Mashtots and in its activities uses all of its scientific and scientific and technical potential. 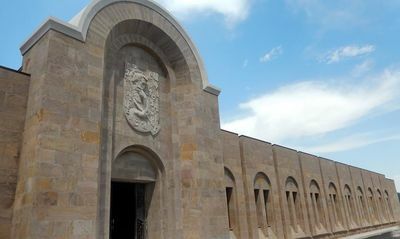 The realization of this idea, which is so important for the whole Armenians, became possible thanks to the selflessness of the former director of the Mashtots Matenadaran, the bright memory of Hrachya Tamrazyan, and also thanks to the diligence, interest and affection of all the employees of the Matenadaran. The governments of Armenia and Artsakh, the Armenian Apostolic Church of Artsakh Diocese have been of great assistance. This Matenadaran is the embodiment of our sense of dignity and values, which we are guided by. This is our message to the world on the 100th anniversary of the Armenian Genocide. This Artsakh scion of the Mashtots main depository of manuscripts again and again confirms the inviolability of our will, our aspiration for the future and our covenant to future generations with the sword, the letter and the pen. The political connotation of this exhibition of manuscripts and documents created in Artsakh is an irrefutable proof of his Armenian identity. Henceforth, anyone who visits the Gandzasar monastery complex will have an opportunity to get acquainted with the role and significance of Artsakh in the development of civilizations.